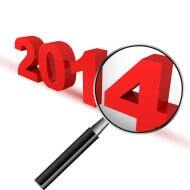 The New Year is a great time to reflect on the highlights and learnings from the prior year. This is where social media can play a great supporting role. Facebook gave me my year in review, which actually was helpful in remembering the events from this past year. A review of our blog posts over the past year added some depth and perspective. My Storify library has a lot of recaps, and you can see many of my presentations (and where I have been) on my Slideshare account. Our videos are on MACPA and BLI YouTube accounts. Together, these paint a picture of what we are up to at MACPA and BLI. This look back covers just some of the highlights from 2014. We ended 2013 with our declaration that 2014 would be the Year of the Sticky Note and our holiday video and post that generated 33,000-plus views! We actually started out 2014 in December 2013 at our Board Retreat. Led by our chair, Marianela Del Pino-Rivera, we decided as an organization to make the Shift Change (see my related LinkedIn post with almost 30,000 views) and share our journey with members. Our year-end message to members included our three watchwords for 2014 – proactive, innovative, collaborative. We also continued to make headlines. Here’s a look at MACPA and BLI in the news. One of my highlights was the release of a video that I believe captures the MACPA’s purpose and the essence of all CPAs. We started the year at the AICPA / CPA-SEA conference to share the latest trends and issues facing our members, the AICPA, and our colleagues in other states. I shared our work and research about young professionals at the Winning is Everything Conference in Las Vegas. CPA Day in Annapolis kicked off our 90 days of intense advocacy for Maryland CPAs. That was followed by a six-hour ride in a van with our first author / speaker, Rita McGrath. Rita is the sixth most influential business thinker in the world and came to Maryland to help CPAs find their competitive edge. Bill’s post covered her visit: If Your Team Isn’t Doing These Six Things, You’re Doomed and The Top 3 Strategic Challenges Facing Organizations. The Digital Now Conference (for associations) is where we keep our L>C as an association. Our Business and Industry Conference and Top 5 Issues Facing CFOs. A 2014 legislative recap: No House of Cards, but CPAs are fine. The Future of learning: Maryland become the first state to pass 10-minute CPE at our State Board of Accountancy. BLI sponsored and spoke at the NABA Annual Conference. Our Innovation Summit: Shaping Serendipity. Keynoting the FEI International Conference with Social Media for CFOs. The Future of Accounting Looks Bright: MACPA’s work with accounting students. Our Beach Retreat over the July 4 holiday in Ocean City and Frank Ryan’s Walk Across America for Charity. CPAs and Government Accountants: Making a Difference. Keynoting the AICPA E.D.G.E. Conference and the 11 Things Emerging Leaders Want You to Know. Bill Sheridan also did a session that centered on the lessons in his book Look, Lead. Love, Learn. Our second author / speaker series with Ron Shapiro. A new strategic partnership with futurist, Dan Burrus to build new competencies around anticipation: You’ll never Guess the Skill All Future Leaders Need. Our office move: MACPA is Making the Shift Change Today. The MACPA’s fourth Leadership Academy: How to Maximize Your Career Trajectory. Keynoting for Collins Barrow, Canada’s eighth largest CPA firm: Leadership Lessons from the Maestro. New CPA Swearing-In Ceremony: Do You Feel Different? Our first Women to Watch Awards are a major hit. Our town hall series: Top Six Issues Facing CPAs. Tax season won’t be delayed. The release of our new BLI website. We ended 2014 with our sequel to the “sticky note” video and a new theme of communication. 2014 was a good year, and we look forward to an even better 2015!